Although more is known now about the nutritional needs of birds, the exact needs have never been determined. Nutrition is the foundation of well-being and longevity for our birds. Nutrition related health problems arise more often with exotic pet birds than with dogs and cats because so much less is known. Most bird diets frequently need an over haul, but bird owners may hesitate to take on the sometimes difficult task. Birds have an innate fear of anything new. The first problem the breeder faces with finches is in encouraging them to take on a new food. I place what I want them to eat on top of the food they want to eat, so they have to pick around the new food. The change can be slow. My experience with canaries and societies show that they are willing to try any food offered. For this reason, I always keep canaries and societies in my aviaries. When the gouldians see the canaries and societies eating the new food, they too will follow suit. I call them my "Teacher" birds! The problem is balance. In the wild birds spend half their time foraging for food. Birds as pets are only a couple of generations removed from the wild, and for that reason, they need food that interests them. "Pellets" are fairly complete nutrition but for birds emotional well-being, I recommend a variety of foods. Another problem is definition of terms. "What are greens?" Birds eating greens in the rain forest is not the same as eating iceberg lettuce. Fresh greens provide the birds with proteins, minerals and, most importantly, Vitamins A and D which are not present in dry seeds. Some examples are romaine lettuce, spinach, turnip greens, mustard greens, radish tops, carrot tops, dandelion greens and chick-weed. It would be impractical to attempt to cover all aspects of health in this article. I have limited the information to the more common health problems that are encountered in the normal activity of keeping finches. Whenever in doubt, advice should be sought from an Avian Veterinarian. 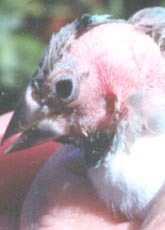 Early signs of illness in finches are frequently not recognized by the owner. As a survival tactic in the wild, a sick finch will attempt to maintain a normal appearance for as long as possible, so that by the time any signs of illness are apparent, the bird may have been ill for some time. The last thing a finch wants to do is go to the ground! The finch that dies "suddenly" may be the result of the owners failure to notice a change in behavior prior to that time. The best indicators of health are the bird�s droppings. Paper towels, newspaper or other smooth surfaces can be used to line the cage bottom so that the number, volume, color and consistency of the droppings can be noted daily. Normal droppings are made up of urine, feces, and urates. The liquid urine consists of a clear, watery substance. A diet high in vegetable and fruit matter may increase the urine componet. The urates, a creamy white waste substance from the kidney, are often suspended in the liquid urine or appear to wrap around the feces. The feces are the food waste material which may vary from a light brown through to almost a black material depending on the diet of seed or pellets. Droppings with a mustard yellow liquid portion is not normal, nor is blood nor rusty brown color in feces. Changes in eating and drinking habits are another indicator, as in, excessive water consumption. A bird that is not interested in food definitely is ill. Does it appear sleepy and lethargic? Is it huddled on the bottom of the cage or sitting low and ruffled? Is it hiding its head under its wing? How about the feathers? Are they dull? Has it stopped preening itself? How about weight loss? Any of these symptoms indicates potentially serious problems. Open mouth breathing or any audible sounds, like clicking or wheezing are certain signs of illness. A tail bob is actually a sign of respiratory distress! Discharge from the eyes or nostrils is a sign of illness as is a swelling around the eyes. The two most important considerations for temporary care until the finch can be seen by your veterinarian are HEAT and FOOD. If your bird displays any of these signs, keep the bird warm: 85 degrees is ideal. An ordinary heating pad wrapped around on the side of the cage (hospital cage) and draping the entire cage with plastic wrap, a blanket or cage cover will work. A ceramic heat lamp, 60 or 100 watt, can be used as an alternative heat source. If the bird starts breathing rapidly and holds it�s wings out away from it�s body, the temperature is too hot. A finch that stops eating dies. Food should be scattered on the bottom of the cage. Offer the finch his favorite foods, by hand if necessary. If sick birds stops eating, then they break down body tissue to keep major organs functioning. To keep the bird alive you must supply easily digested, high potency food directly to the crop. Thrive is the perfect treatment in these cases. Thrive should be given to revive weak finches until they can get to the vet. Thrive's unique blend of energy, protein and vitamins is unsurpassed in aviculture. The potent energy and protein contained in Thrive are quickly absorbed by the bird to supply desperate body needs. Now the bird has a chance to start fighting the disease or begin repair of injury. Supply an electrolyte NV Powder in the birds drinking water while in the hospital cage. This supplement will allow your bird to fight the disease or trauma that put it in the hospital cage initially. It is not a cure: it simply gives the bird the energy, protein, electrolytes and vitamins to help the bird fight for recovery. Then make an appointment to see your vet.